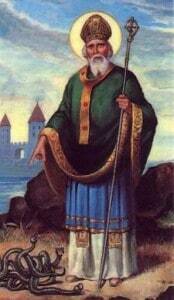 The exact date of St Patrick’s birth is not known, but it is thought that it was around the year 386 AD. As everyone knows, St Patrick’s Day is celebrated on March 17th, the presumed date of his death. The location of his family at the time of his birth is not known. Debate rages on the subject, with some commentators believing he was born in the north of England and others in Wales, while others still favour Scotland. St Patrick’s childhood years are mostly shrouded in mystery, although it is believed that he lived a fairy privileged life, as all sons of affluent Roman Britain families would have done at that time. That happy time in his life came to an abrupt end, though, when Patrick, along with many others, was captured by a posse of marauding Irish pirates and taken by force to Ireland, where he was kept against his will for the next six years, working as a shepherd in a remote part of County Mayo. This is one of the tales often recounted by merrymakers across the nation on March 17th, St Patrick’s Day, while enjoying a shamrock-topped pint of Guinness, as is the legend that he banished all the snakes from Ireland. It was then an event occurred that changed the course of his life: he had a profound religious experience, hearing a voice that told him to prepare to leave Ireland. Heeding this message, Patrick set off to walk to the coast (a journey of almost two hundred miles). There, eventually, he found a boat that would take him home. After after his daring escape, it is said that Patrick experienced another religious revelation. This time, he was told by an angel that he should return to Ireland to work as a missionary to spread the Christian word. Before doing so, Patrick took religious instruction for fifteen years in Gaul, after which time he finally took his vows as a priest and made his way back to Ireland. Patrick’s seventh-century biographers would have us believe that he converted the whole of pagan Ireland to Christianity. While this is an overstatement of the facts, it does seem that his mission was a very successful one. He had a number of skills that he used to his advantage. His six years of captivity in Ireland meant that he could speak Gaelic and was familiar with the local culture, and he used this knowledge to subtly introduce the concept of Christianity rather than riding roughshod over the native belief systems. For example, the pagans worshipped their gods with fire, so Patrick celebrated Easter with bonfires; he also took the pagan sun symbol and added it to the Christian cross, resulting in a hybrid of the two known as a Celtic cross. It was not all plain sailing, though. Patrick did manage to upset the locals on several occasions and found himself imprisoned as a result, though he did manage to escape on each occasion. He travelled widely around most of the country, setting up monasteries, churches and school as he went. After around thirty years of tireless work, he retired, basing himself in County Down. It is thought that he died there on 17th March 461 AD, the date that is celebrated across the world as Saint Patrick’s Day. A wonderful collection of myth and oral legend has been woven around the figure of Patrick, and while there is undoubtedly an element of hyperbole in the resulting tales, they are a true reflection of the Irish tradition of exciting narrative. One of the most famous folk tales associated with Patrick tells of how he drove every snake from Ireland. If you interpret this literally, you immediately find a flaw – due to its somewhat intemperate climate, there never have been any snakes in Ireland. However, if you look at the story from another viewpoint, you can equate the ‘snakes’ with the pagan beliefs that Patrick worked so hard to eradicate from the country. Another oft-repeated Irish tale, which may perhaps have some basis in fact, is how Patrick used the shamrock’s three leaves to explain the Christian concept of the Holy Trinity, demonstrating how three separate entities can exist as part of one whole. Those that followed his teachings are said to have adopted this ‘flower of Ireland’, wearing it on St Patrick’s Day, a tradition that is still followed, while bright green remains the pivotal colour for celebrating all things Irish. Another piece of mythology tells of the time when Patrick was travelling back to Ireland. The story goes that, as he travelled, he would stop and preach at various locations. He always carried with him a trusty ash walking stick, which he would push into the ground while he talked. At one location where he paused, it took him so long to convert the people that by the time he was ready to leave his stick had taken root in the ground, like a tree. A piece of writing dating from the 12th century tells how Patrick seemed to cross time and space at one point during his evangelical tour, meeting the famed ancient warriors Oisín and Caílte mac Rónáin, who had lived centuries before. In this allegorical tale, Patrick attempts to convert the two men to Christianity, while they seek to defend their pagan beliefs. The colourfully bold pagan way of life with its feasting and fighting is compared to the peace-loving, calm life led by Christian folk. Dublin has its own tribute to Patrick that has an element of folklore attached. Saint Patrick’s Cathedral, built in his honour, is located next to the well where it is said he would baptise his new converts at he made his way to the city. St Patrick is a feature of countless stories in Irish folklore, and in some ways he is inextricably linked with the Irish identity – both at home and further afield. 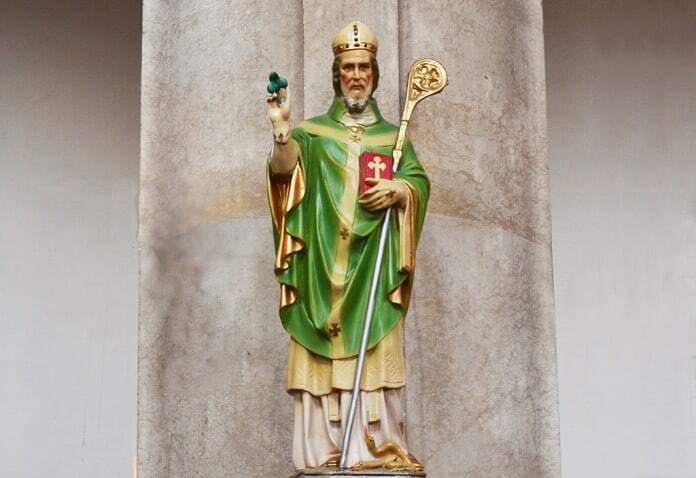 He is a deeply symbolic figure who has resonated through time as a religious legend who banished all the snakes from Ireland, as a true national treasure and as an ultimately patriotic symbol that is equally as significant as the colour green and the shamrock that is so associated with St Patrick’s day on March 17th. It is believed, though not known for certain, that St Patrick was laid to rest next to St Columba and St Brigid in the cathedral in Downpatrick, County Down. Also in Downpatrick you will find the Saint Patrick Visitor Centre. This is a wonderfully interactive way of learning more about the life and legends (including his skill at banishing snakes!) of the man who has become so firmly enmeshed into Irish tradition and culture, and who is celebrated with such great shamrock-strewn enthusiasm every March 17th on St Patrick’s Day.